On a cold Wednesday night in February, nothing could be more delicious than a cup of strong experimental music performances at the Apothecary on Eagle Street. An interdisciplinary art space that opened up in 2012 and operates out of the historic YMI building. 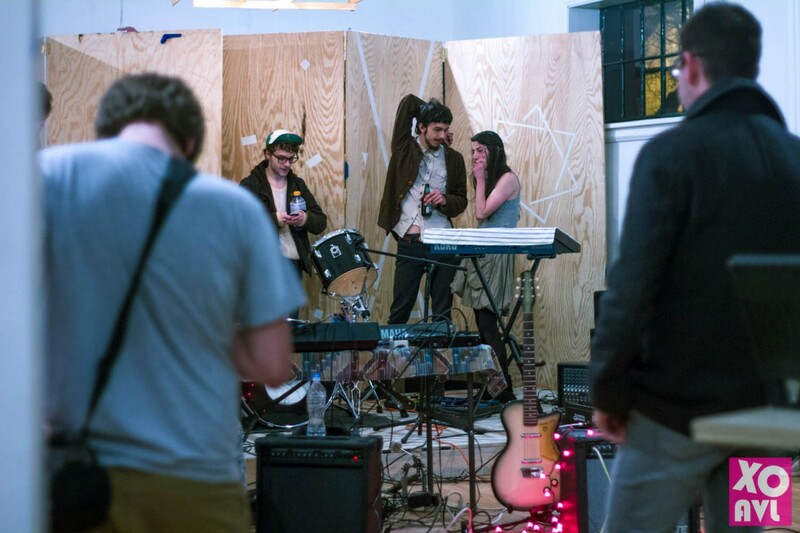 The Apothecary, run and owned by several of Asheville’s well known experimental music performers and artists, has become the new creative hub for many artists devoted to experimenting with their medium, whether it be music, performance art, dance or visual art. Apothecary started out as an idea and vision that took off as soon as it started. Adding to the already burgeoning experimental music and Drone/ Ambient scene in Asheville. Every week and weekend Apothecary bustles with new shows, performance art, installations and weekly movie nights. Joining Headway Recording‘s (now a record label) which had been for 2 years the only standing event platform for sonic experimentation, acoustic and Drone music, Static Age (record store and event space on Lexington Ave), Harvest Records (record store, label and event space in West Asheville) and Blackout Effectors (instrument manufacturer), the Apothecary has become an excellent addition for the experimental arts scene in this city. Since Apothecary’s opening almost every performance has left audiences in awe. Last week was no different. On the bill was Asheville’s own Artifax (Cody Sarabia) with her sound explorations, Andy Loebs (drummer, guitarist, loops and textures), Subtle Body (Joe Moresi) with his modular synth made by Make Noise (local modular synthesizer engineering company) and Nothing But Net (Brian Kinkade). The evening was packed with sound explorations and downright beautifully orchestrated compositions, nothing was left for the mainstream ear to grab on to. From the very first note to the last, it was clear that each artist was on a mission to do their absolute best when it came to exploring the frontiers of their creativity. Starting with Artifax, aided by musicians Devin LeCroy (who will also play in Nothing But Net later on) and David Grubba; one of the main curators/organizers of the Apothecary well know for his extraordinary musicianship, the evening begins with voice samples from what sounds like old radio shows and Devin’s percussive playing who attentively follows Cody’s electric guitar improvisations and small melodic patterns. Together the three really create this perfect intimate yet exploratory atmosphere that sets the tone for the rest of the evening. After Artifax, Andy Loebs kicks it up in amplitude with a stunning performance of textures, rhythms and sound design using two digital synths, a looper, and a host of sound toys. With no hesitation, Andy starts off by intermixing long cymbal washes, bell sounds, chimes, gongs with poly-rhythmic sounds and drum patterns, then the melodies kick in and everything goes to a whole new level. A beautiful combination that ends in a climactic wash of reverb and delay. Andy’s performance garnered a standing ovation. Then the audience is treated to the amazing pure electronic sound explorations of Subtle Body (Joe Moresi) who goes on the loose with his modular synth which definitely doesn’t hold back at all. From sheer angular sounds to incredibly complex modulations, traveling in and out of this loosely based composition that provokes and evokes all kinds of imagery; I’m reminded of the bottom part of the famous Hieronymous Bosch painting; Garden of Earthly Delights. From beginning to end, one could wonder, how can a machine produce such sounds. Soon after, Brian Kinkade as Nothing But Net, along with Devin on bass, Andy on drums, Jody Wall on guitar; begin their set with an instant strong piece, beautifully orchestrated and very well composed. You could tell that Brian had rehearsed his songs for quite some time on his own before they were ever played by a full band. Brian’s presence was felt throughout every piece as a music conductor giving everyone the right amount of personal space to be expressive yet holding the ship to its definite course. As each song went by, Andy’s playing became like the giant engine of a train, tireless, fiery yet very sensitive to each member’s playing. It seemed as if the songs had attained a new life of their own, which is a treat for any composer/songwriter, as Brian would later explain. What was most impressive with Nothing But Net was how loose the pieces were, yet so tight in their structure with Devin holding the electric bass down and Jody being very steady and delicate in his approach to each song. However, Brian’s relentless keyboard/synth approach kept everyone on track with instant confidence, never missing a beat anywhere in the songs. It seemed the band could’ve gone on for easily 2 more hours as it seemed it had barely broken a sweat at the end. Definitely reminiscent somewhat of the late Krautrock days in Germany, I hear Nothing But Net ‘swooooshing’ at every performance, as to explain a bit the origin of the name of the band. To not be missed next time these wonderful musicians play at a venue near you.